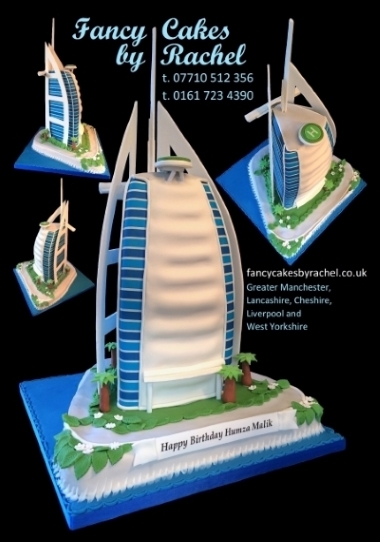 At Fancy Cakes by Rachel we are regularly asked to create cakes to reflect a hobby or pastime or a fantastic holiday. We have made a fish cake for a fisherman, guitars and drum kits for musicians, a cowboy hat, saloon bar and jail house for fans of the Wild West, football shirts for the fans of various football teams, sports cars and vans, Hermes and Radley handbags, Ipods, cruise ships, the Empire State building, Lombard street in San Fransisco, gardens and allotments, canoes, birds and animals, Casino cakes and DJ cakes and many more. We have made sofa cakes with a sugar figure of the cake's recipient sitting or lying on it, a figure sitting on a bar stool in his favourite pub, the figures of a pop band on a cake, Elvis sitting on a burger cake, cowboys, drummers and lots more. Have a look at the Birthday cake gallery to see some of our cakes with figures and get ideas for your own cake.